On a rainy day in 1995, Tammie was carpooling to work with neighbors when their vehicle hydroplaned and flipped multiple times. "I remember waking up sideways in the passenger seat, but I couldn’t move to get out of the car," recalls Tammie. "After the accident, I wanted to be independent again more than anything, so I took charge to learn some new skills and applied for a service dog." As excited as Tammie was to get a service dog to help her at home and out in public, she was terrified of being away from her house and without her specialized equipment and caregivers. 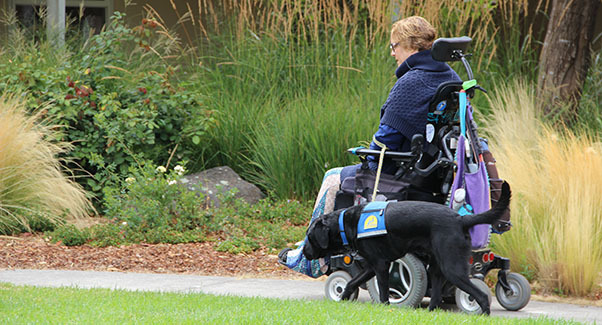 "But from the time I rolled onto Canine Companions’ campus, I immediately felt at ease," says Tammie. She was matched with her first service dog, Robby. "We learned to work together as a team to maximize my independence. He was the perfect match for me," says Tammie. "I came away from Team Training with more self-confidence than any other experience in my life. With my service dog by my side, I am self-assured when out in public or without my caregivers." By donating today, you can Make a Match. Give Independence — and Give a Dog a Job. What's better than puppy love? Send an adorable eValentine to someone you love and they'll almost be able to smell the puppy breath! When you donate in honor of someone special, you can select an adorable Canine Companions eCard to be sent with your personalized message. “Raising puppies has given our lives a sense of purpose. It’s a win-win,” explains Teri and Nick. “Being a volunteer puppy raiser has given us an identity much bigger than our individual selves and has brought us closer as a couple.” Read their full story. Does your company have a matching gifts program? Your donation could be doubled or possibly tripled! Some companies match volunteer hours or gifts made by retirees and/or spouses. Find out if your company matches their employee contributions at cci.org/matchinggifts. National Graduation Day is this Friday! Join us and feel the love. It all starts with a puppy...and you! Love Shack Shakes at Shake Shack. Start your week off right! Don't miss puppy Mondays.